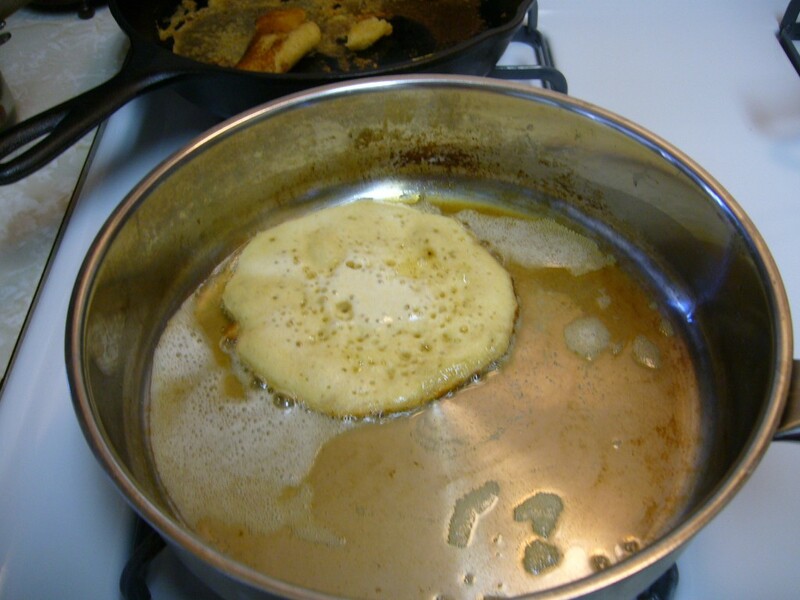 The latest thing I learned from my real food cooking eCourses was to make soaked pancakes. 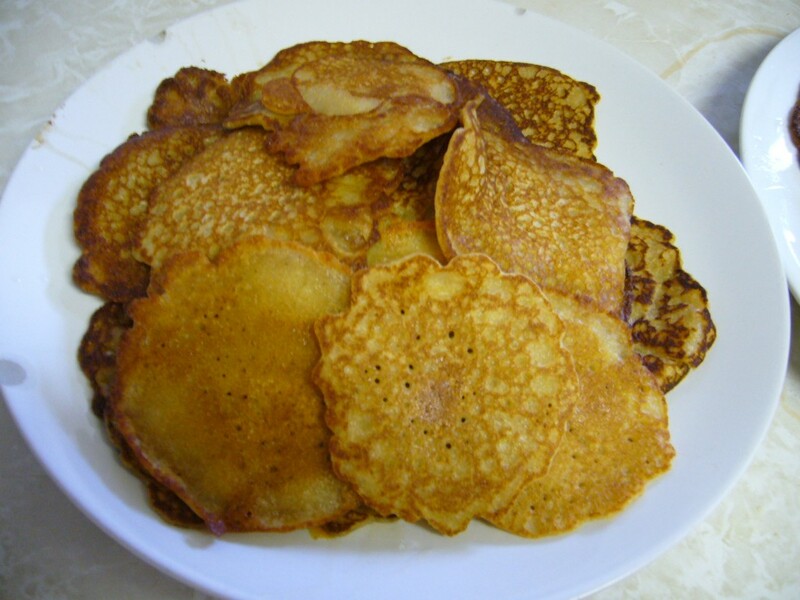 These are really similar to regular pancakes, except that there is a soaking period to help neutralize the phytic acid in the flour. As a reminder, phytic acid is an anti-nutrient that prevents our guts from properly absorbing the the foods we consume. 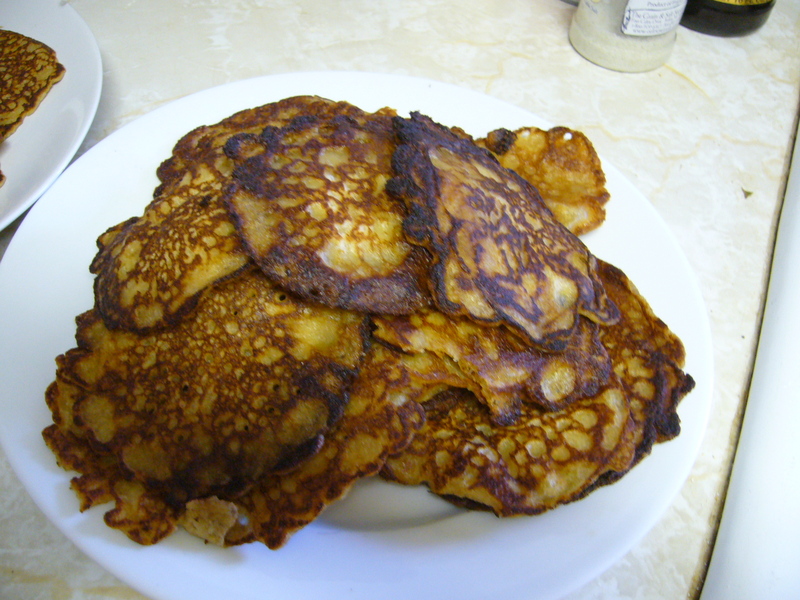 After the soaking period, most phytic acid should be gone, leaving these pancakes super yummy and really healthy for us. These turned out so delicious, I can’t wait to invite people over for brunches and cook up a huge batch for them! Though the recipe was easy to follow, as you’ll see, I still had some issues along the way. 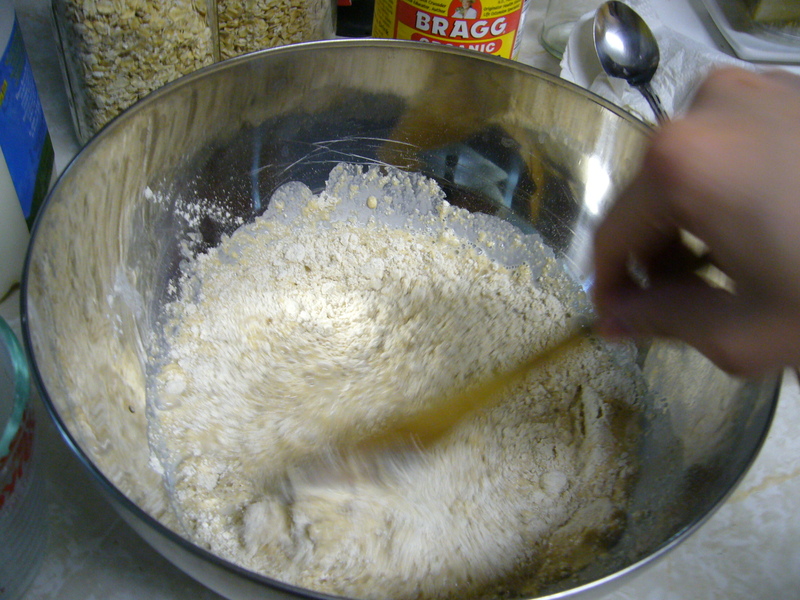 The first step was to prep the batter the night before. 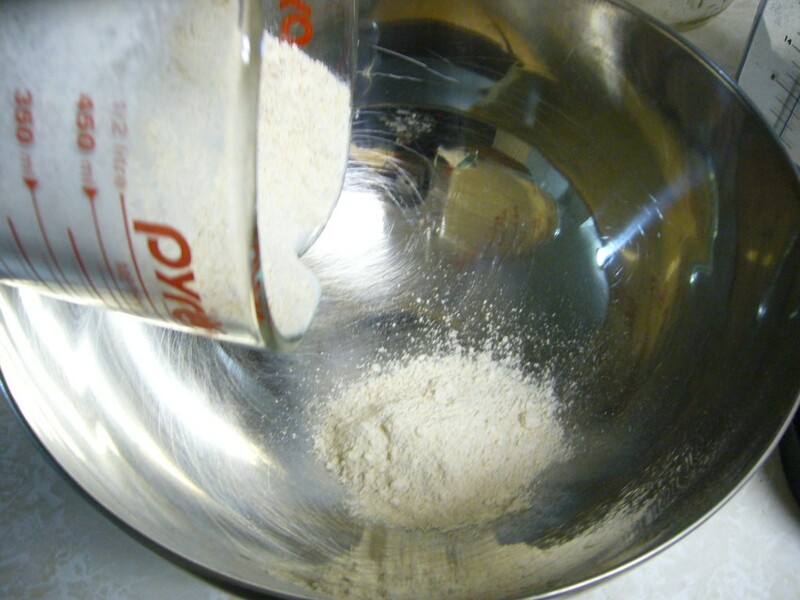 I milled up some fresh flour and measured out the amount I needed for the recipe. 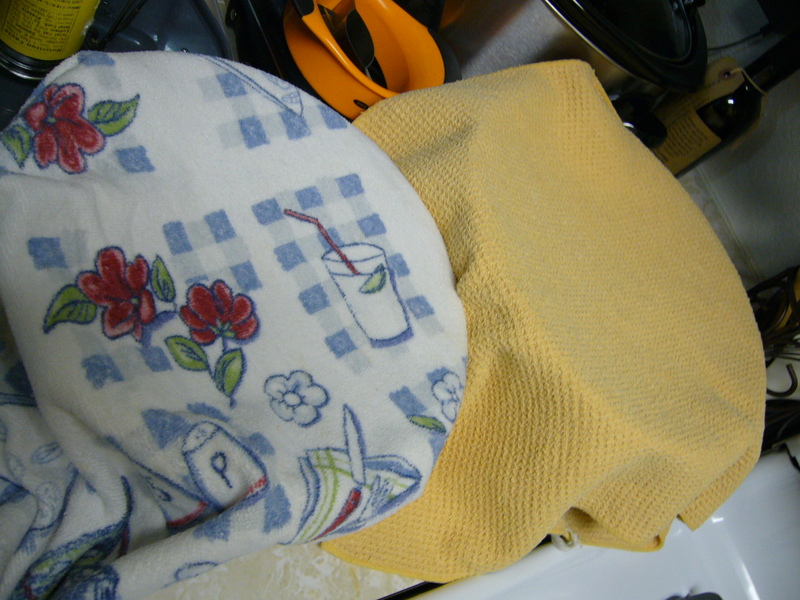 Then I added apple cider vinegar, which will be the acid used to help the soaking process. 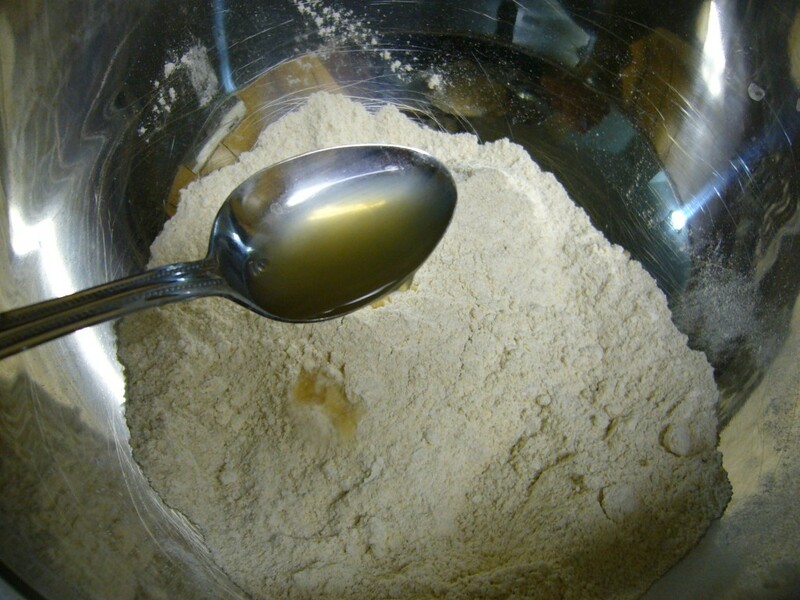 Add apple cider vinegar as acid to help neutralize phytic acid in flour. 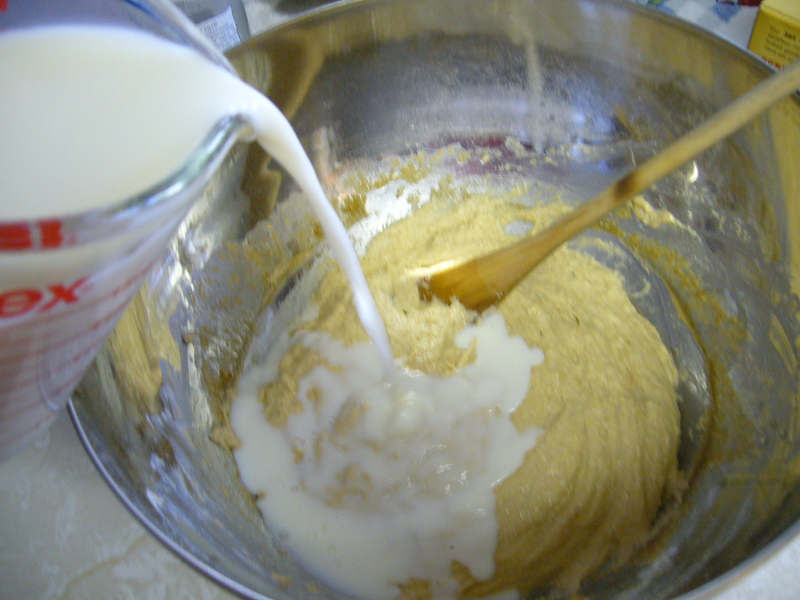 Next, I added pastured raw milk as the medium for the flour to soak in. 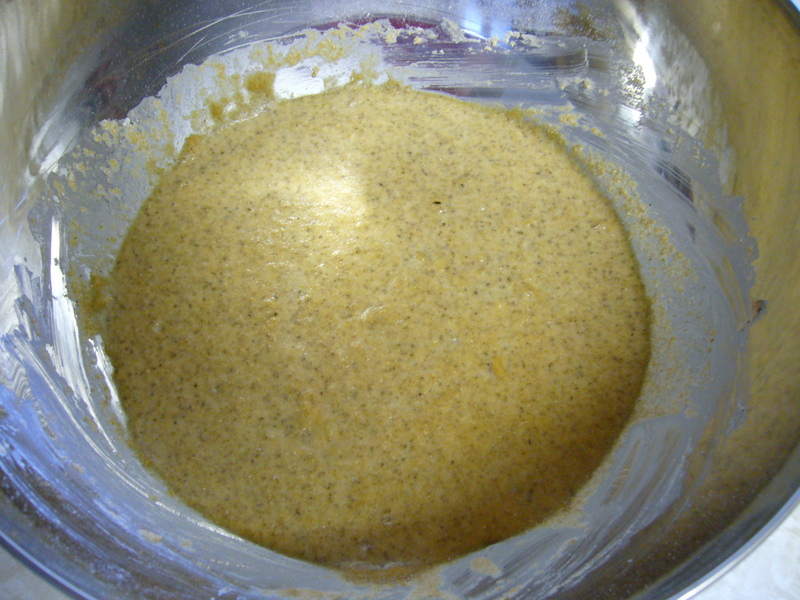 After mixing it all up, the mixture was ready for an overnight soak. Soak overnight. I think I was soaking some muffins at the same time. The next morning, the mixture looked like this. I proceeded to melt some coconut oil. 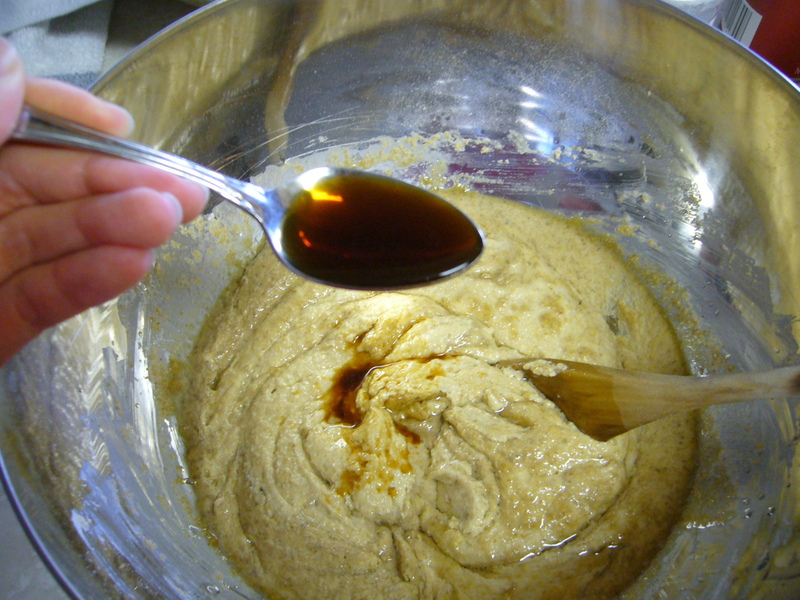 And added it with vanilla extract to the mixture. 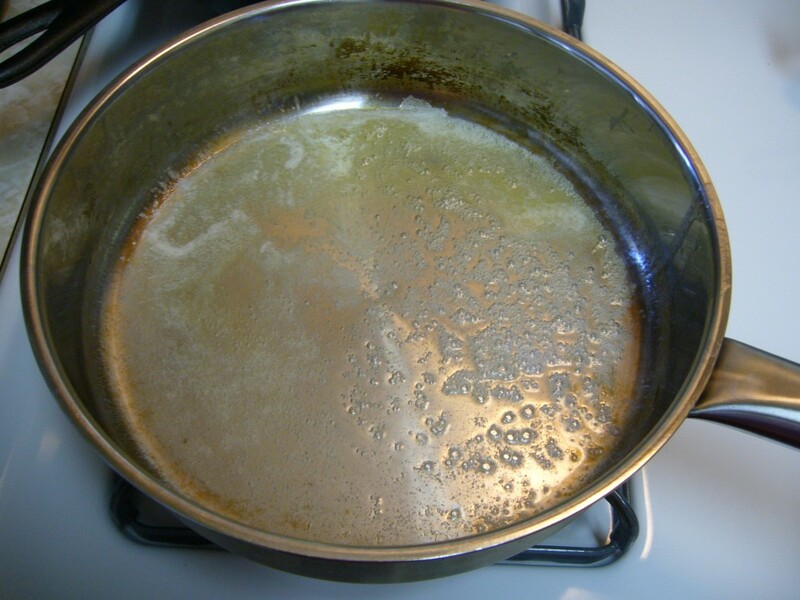 Add vanilla extract and melted coconut oil. 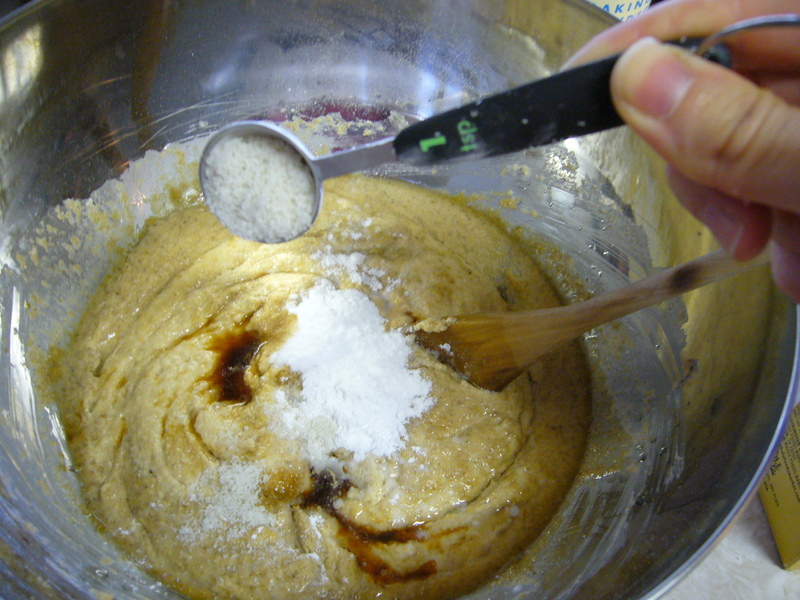 Then, I added the dry ingredients: baking powder, baking soda, and sea salt. 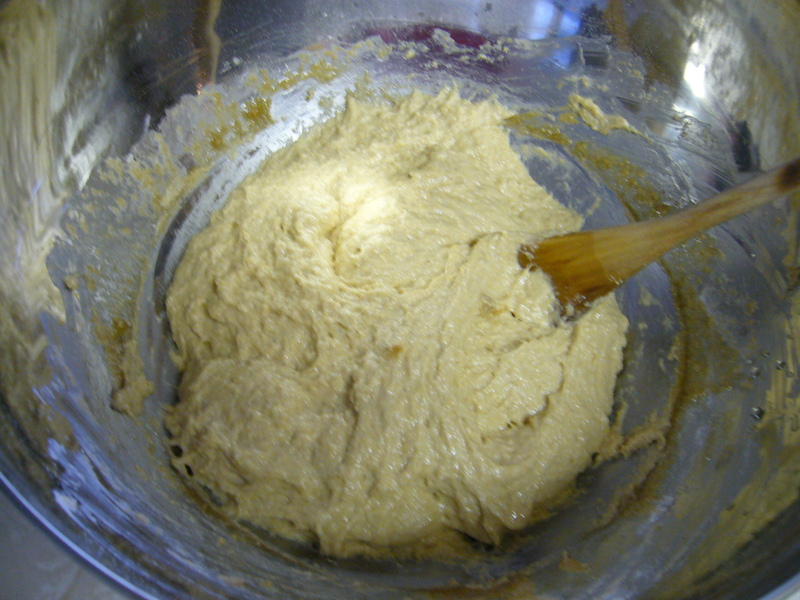 I mixed it all up and created a very sticky mixture. I added milk to help create a more pancake-like batter. 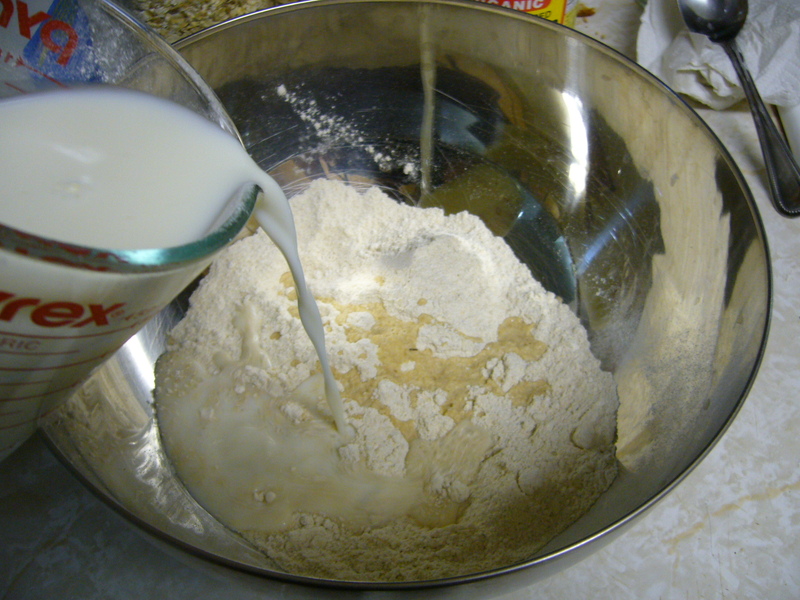 Add more milk to create right consistency. Now it looks ready to cook! So far, the recipe has come out perfect! Perfect pancake batter consistency! Ready for cooking! 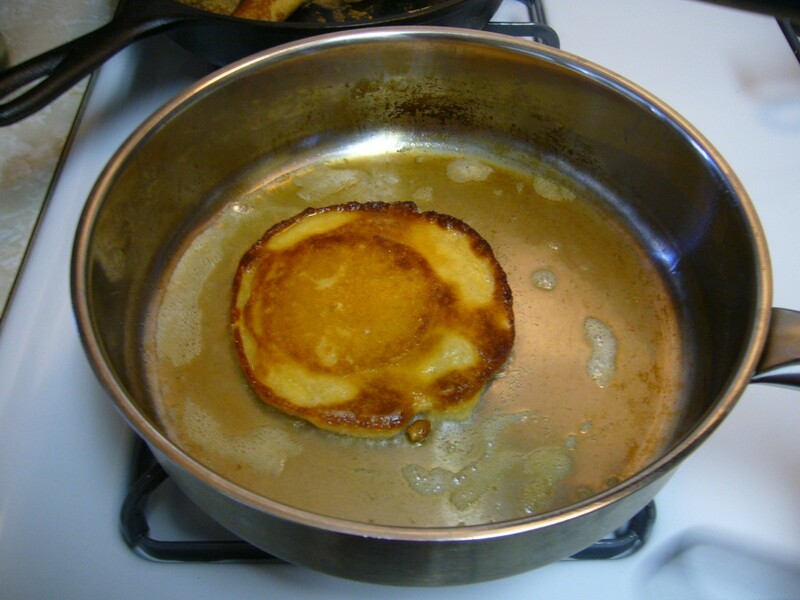 Unfortunately, I tried to cook the pancakes in an unseasoned griddle, and the pancake stuck to the pan for dear life! I was so distraught by it, I didn’t even get a picture of the disaster. First griddle fail. When I tried to flip these, they just wouldn’t budge! At this point, I was pretty starving, since this was my breakfast I was cooking up, and feeling very down about the griddle fail. But my tummy grumbled again and I knew I needed to get something cooked up so I just shrugged off the disaster and found another pan to cook the pancakes in. This metal one proved to be just perfect. 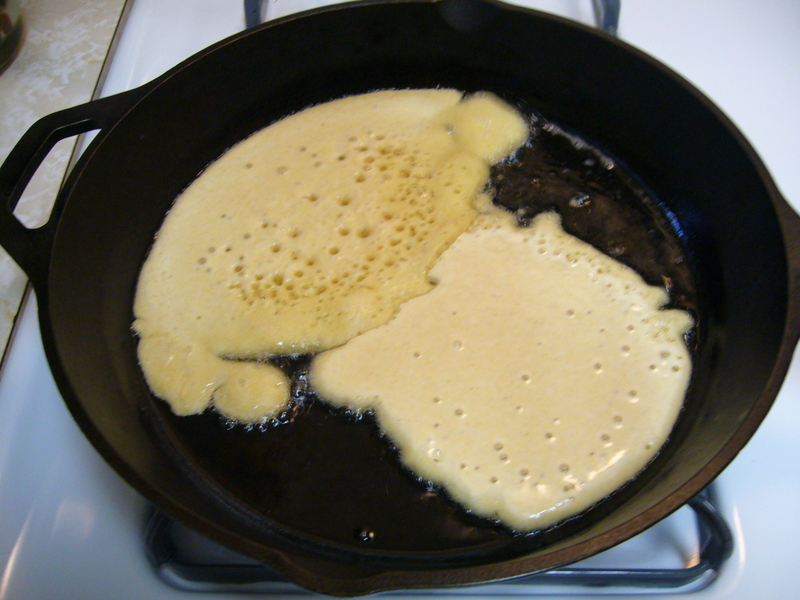 Less sticky pan = better griddle for pancakes. 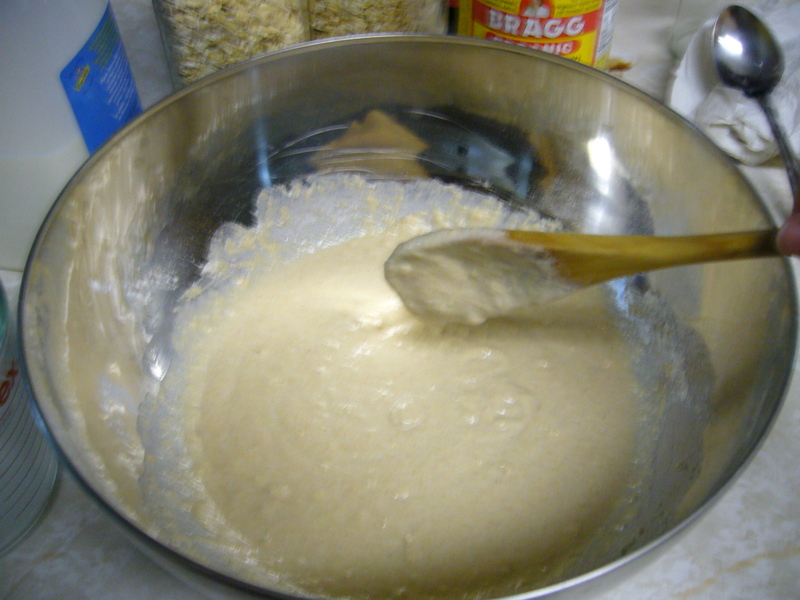 After preheating the pan, I poured in some batter. 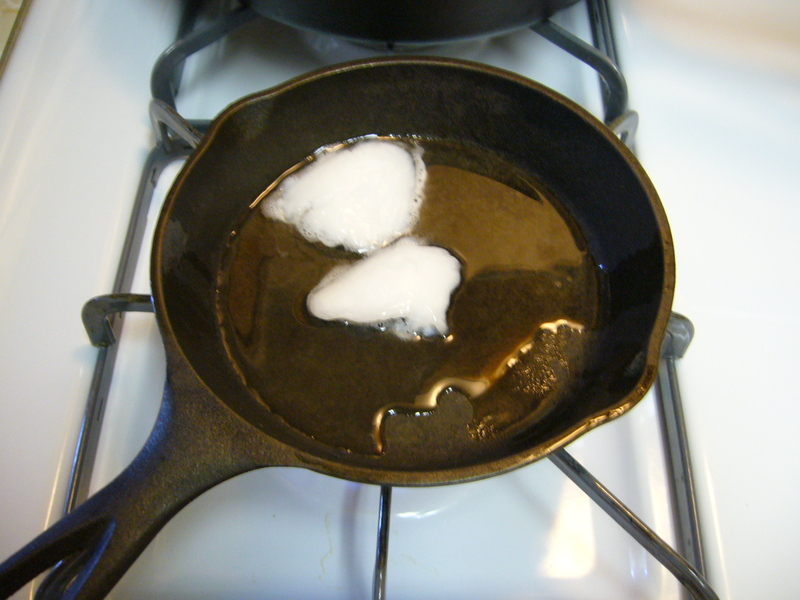 Pour batter into pan and wait for bubbles to emerge before flipping. This one needs to be flipped soon! You can also see a sliver of the mess that came out of the failed griddle! After flipping, I felt much better about the situation, this one looks edible! Flip! Oooh, looks yummy so far! After the first successful pancake, I proceeded to cook up the rest of the batter. More pancakes! Depending on the heat of the pan, the pancakes came out in different shapes. A pile of golden pancakes. They were as delicious as they look. Finished batch of golden pancakes. I had trouble keeping the stove to the right temperature, so some of them came out more crispy and burnt looking. But these tasted just as good as the golden ones. A crispy batch. Equally as delicious. These were cooked on a higher temp than the golden batch. Needless to say, these pancakes were absolutely delicious, and I make them as often as I can. The first time Rene and I ate them, we didn’t have any protein with our meal, just these pancakes. While it wasn’t an ideal meal for us (we’re protein types and thrive off of lots of protein and fats), we weren’t hungry for over 8 hours after eating breakfast. Must have been all the butter and coconut oil fat that was soaked up in these pancakes from cooking. Yum! 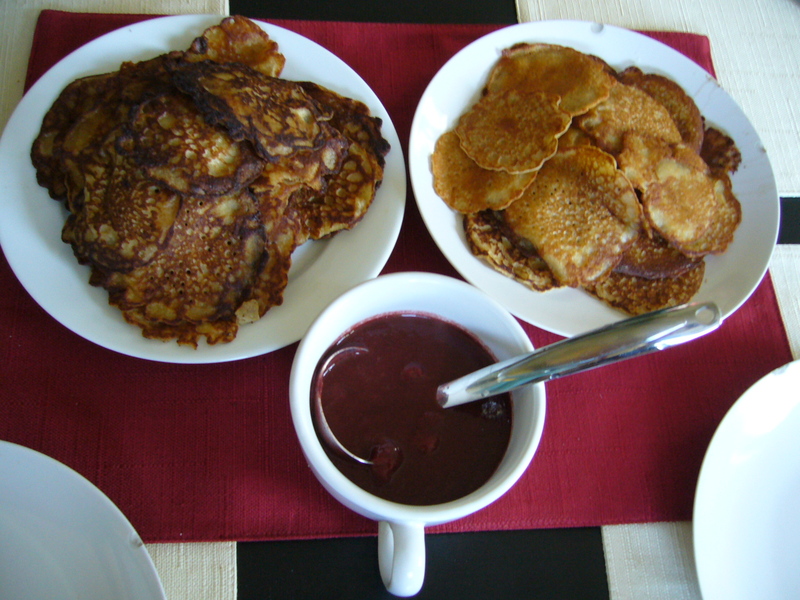 Here are some samples of breakfasts we have had with these yummy soaked pancakes! Paired with homemade berry sauce, all ready for eating! 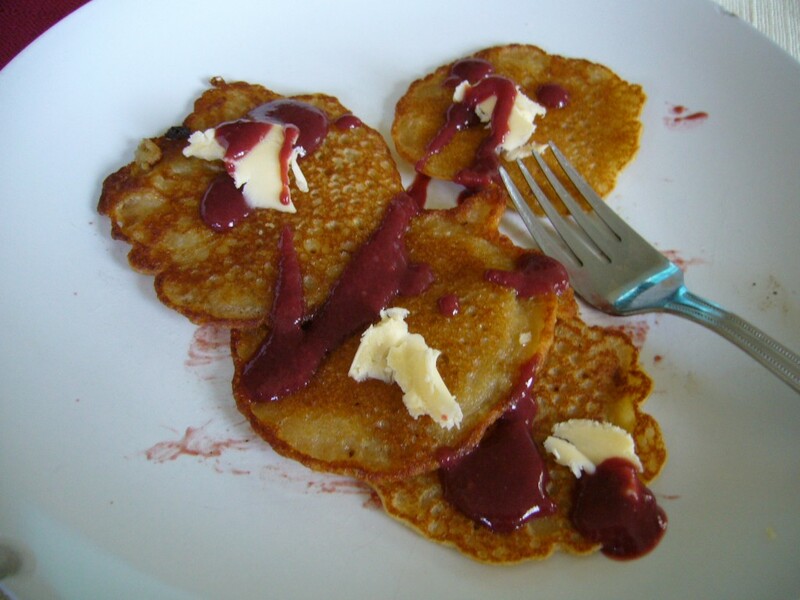 I like pairing my soaked pancakes with raw butter and homemade mixed berry sauce! 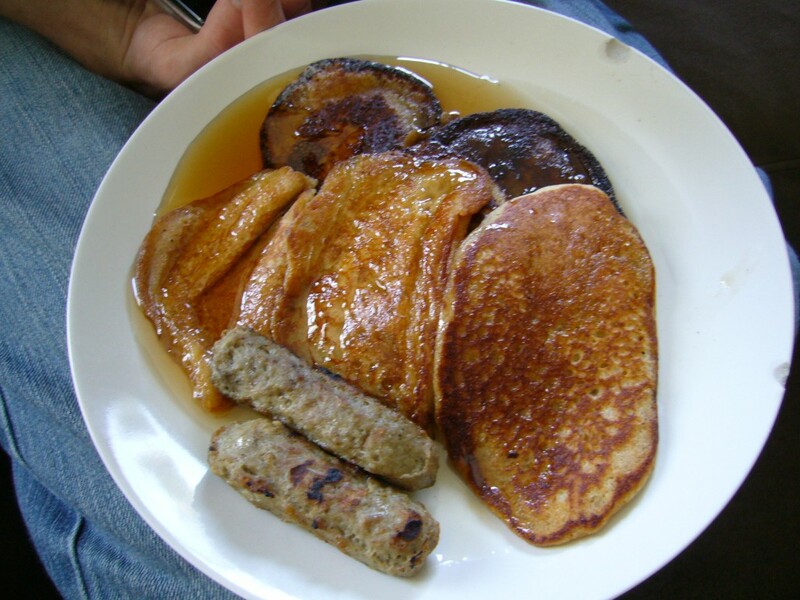 Soaked pancakes drenched in maple syrup and paired with turkey sausages. 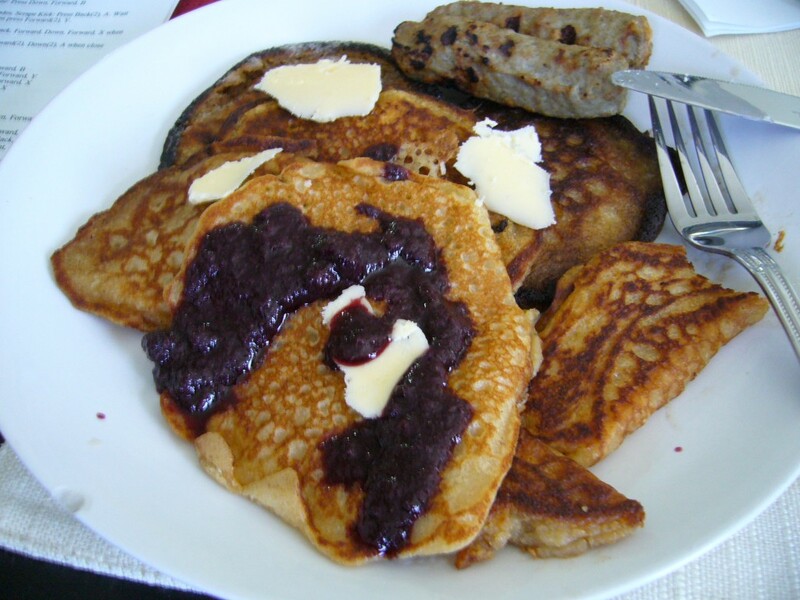 Soaked pancakes with butter, blueberry sauce and turkey sausages. Stay tuned to see how I made that mixed berry sauce! It made for a delicious addition to the pancakes, even better than maple syrup. 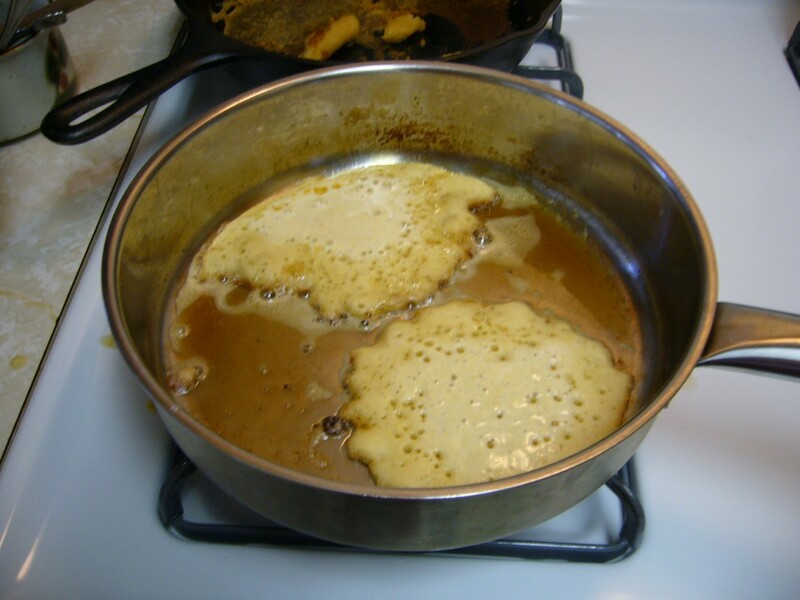 Have you ever tried cooking up soaked pancakes? If not, you definitely should, they’re really easy, and totally worth it! 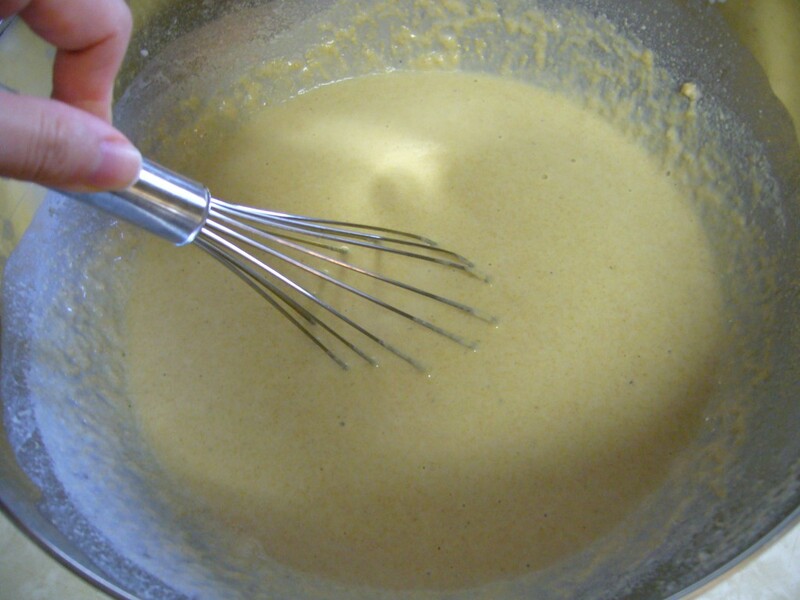 Do you have a great recipe for pancakes? I’m so excited by how delicious these came out to be, I want to try many more! Please share your awesome recipes! Tell me how they come out! I hope they're super yummy like mine were. can u give the quantities?